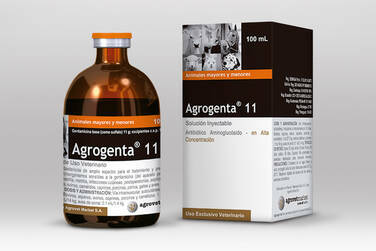 Agrogenta® 11 is an aqueous injectable solution, based on gentamicin, an aminoglycoside antibiotic bactericide of wide spectrum. It has a bactericide action against Gram-negative bacteria (including: Pseudomona spp., Klebsiella spp., Shigella spp., Pseudomona aeruginosa, Enterobacter spp., E. coli, Proteus spp., Salmonella spp.) and Gram positive (Staphylococcus pyogenes, Streptococcus faecalis, Diplococcus pneumoniae). Others sensitive bacteria are Pasteurella multocida, Haemophilus influenzae, Mycoplasma pneumoniae, Mycobacterium tuberculosis. Gentamicin also can have action against bacteria resistant to other aminoglycoside antibiotics (such as streptomycin and kanamycin). Treatment and prevention of infections caused by microorganisms that are sensitive to gentamicin (of the genitourinary, respiratory and gastrointestinal systems). Also useful in cases of mastitis, metritis, posoperatory and cutaneous infections, septicemias, among others. Cattle, horse, sheep, swine, camelid: 1 mL/27.5 kg of b.w. ; young animals, dogs and cats: 1 mL/14 kg; poultry: 0.1 mL/1.4 kg; each 24 hours for 3 to 5 consecutive days subcutaneous or intramuscular route. Intrauterine or intra-mammary route: cows: 2 mL diluted in 20 mL of physiological saline solution for 3 to 5 days. Mares: 20 mL diluted in 200 - 500 mL of physiological saline solution for 3 to 5 days (only intrauterine route).